ITEM #SH CONV: SHEAFFER FOUNTAIN PEN PISTON CONVERTER. Typcal Sheaffer fat profile. ITEM #SHEAF SLIM: SHEAFFER SLIM CARTRIDGES FOR FOUNTAIN PENS. These are empty, dried - out and not punctured. They will need to be cleaned out before use, but this slim profile isn't made anymore. 6 in a pack. Cleaning would typically be done by puncturing the front end with a pen that it fits The piuncture tube of the pen), flushing it out with a syringe and a detergent solution, or ultrasonic cleaning after filling with water and/or detergent. ITEM #PFMFEED: NEW FEEDS FOR SHEAFFER PFM. New old stock. These were rescued on the way out to the dumpster while the Sheaffer plant was being dismantled. ITEM #TARGANIB14K: 14K NIBS FOR SLIM TARGA FOUNTAIN PEN. NEW OLD STOCK. Available in Fine, Medium, and Broad - please specify when ordering. Please be aware of the size differences between the Standard sized Targa and the Slim Targa: The standard sized Targa has an inside diameter on the barrel threads of 0.384" and the Slim Targa barrel has an inside diameter of 0.293". ITEM #TARGANIBSTEEL: STEEL NIBS FOR SLIM TARGA. NEW OLD STOCK Available in XFine, Fine, Medium and Broad. Please specify when ordering. Please be aware of the size differences between the Standard sized Targa and the Slim Targa: The standard sized Targa has an inside diameter on the barrel threads of 0.384" and the Slim Targa barrel has an inside diameter of 0.293". ITEM #TRZNIBGOLD: 14K NIBS FOR TRZ FOUNTAIN PENS. New Old Stock. Available in Fine and Medium. Please specify when ordering. ITEM #200 SH 330 FRONT ENDS, GP: GOLD PLATED FRONT ENDS FOR CARTRIDGE FILLING HEAFFER 330 IMPERIAL FOUNTAIN PENS. Available in Fine, Med, & Broad only. ITEM #SHEAF FILLER: SHEAFFER BALLPOINT REFILLS. Specify color (blue or black) and Fine, Medium, or Broad. ITEM #SH PRESSBAR L to N (SPECIFY WHICH): SHEAFFER FACTORY ISSUED ORIGINAL PRESSURE BARS. New old stock Sheaffer parts; 3 different types of Sheaffer pressure bars like the ones you've pulled out that were too mangled up to get back in. Specify by letter (L through N) which you would like to order. A great way to keep your Sheaffers all original stock. Size L fits a Balance barrel that is 3.14" long (with no section). The bar itself is 2.14" (54.4 mm) long. Size M: The bar is 2.40" (61.1 mm) long. Size N fits a Balance barrel that is 3.35" long (with no section). The bar itself is 2.46" (62.5 mm) long. ITEM #SH FEED-: HERE IS A SAMPLING OF SHEAFFER FEEDS FROM A TO Z - This is nowhere near all of Sheaffer's feeds used, but a scratch on the surface. To order, just use an item number with the letter you are interested in appended to "#SH FEED- ". 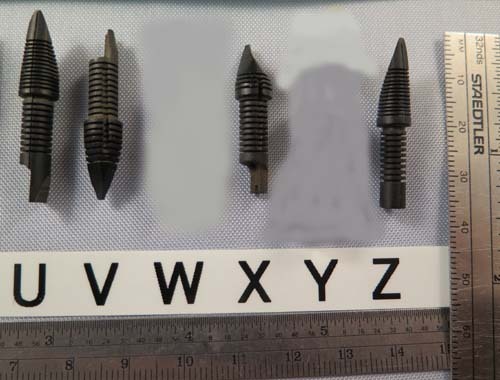 A note about feeds U,V,W,and X: These all use a bushing , shown in slot Y in the images below. You probably don't need this if it stayed in your pen, but all 4 examples of feeds, U,V,W and X, came in a pen with this bushing screwed inside the section, and there is just one size bushing. V and W are the same feed, but W has a bushing on it). These bushings are new old stock and they are $15 each. The diameters of the feeds (of the part that fits into the hole in the section), is shown below. Again, Y shows 3 views of the bushing. 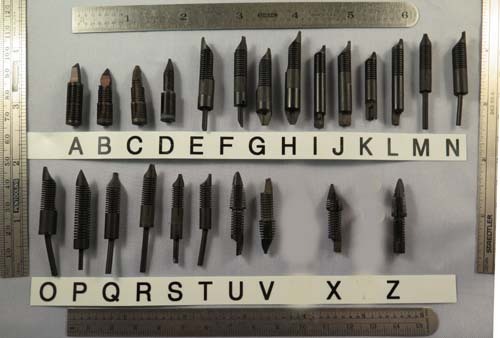 ITEM #SHEAFFER PISTON/PLUNGER SHAFTS: Sheaffer's repair manuals list 14 different lengths of these used. 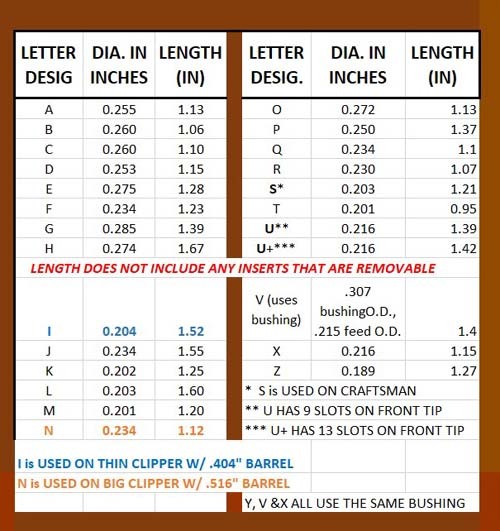 If you need one, try to figure out the length (BETWEEN the threads) and I'll see If I have it. To buy please email Pentooling.Be sure and provide a shipping address that the US Postal Service will accept. If you're outside the US,try your address on Google Earth. If they can find it, it is probable that the USPS will accept it. ITEM #PFMSPRING: AMERICAN MADE STAINLESS STEEL REPLACEMENT SPRINGS FOR PFMs. Won't rust. 1" long X .4" Outside diameter. ITEM #5119: SHEAFFER FINE INLAID 14K NIB/SECTION IN GREEN. No cracks. Excellent condition. ITEM #5474: NIB/FEED/SECTION (front end) FOR SHEAFFER MODERN BALANCE. 18K medium, two tone nib. This front end will also fit the Connaisseur, but the Connaisseur doesn't hve a two tone nib. Tested and smooth writing. ITEM #5269: SHEAFFER HOLSTEIN FLAT TOP FOUNTAIN PEN CAP. This is for a very large pen; it's too large of a diameter for other over sized Sheaffers that I've tried it on. The inner cap diameter is 0.517" before the threads start. The outer diameter on the cap band is 0.587" . The outer length is 2.464".White dot on cap.